The notion that preemptive “surgical strikes” by air forces, missiles or special operations troops can solve our national security threats seems to gain currency with American policy makers every few years; the promise of a low cost – high return solution to a problem is a siren song few presidents can resist. Even worse, Dr. Arquilla acknowledges that this sort of preemptive strategy faces a major impediment to success – the need for knowledge. While the missile that hits a terrorist camp may be comparatively low in material cost, the cost of collecting the “big data” that made that strike possible is not cheap in material terms, or loss of our own liberty. Public outrage at the disclosure that the NSA is intercepting U.S. domestic communications is at such a boil that Rep. Jim Sensenbrenner, the Patriot Act's chief author, said the House of Representatives will never renew provisions that allow the National Security Agency to collect Americans' phone records, and he expects the program will end sometime next year. The idea that every American should give up their privacy to facilitate a missile strike on a building on the other side of the world – that may or may not be a terrorist safe house – will strike many Americans as a very costly strategy indeed – especially when there’s a better way. 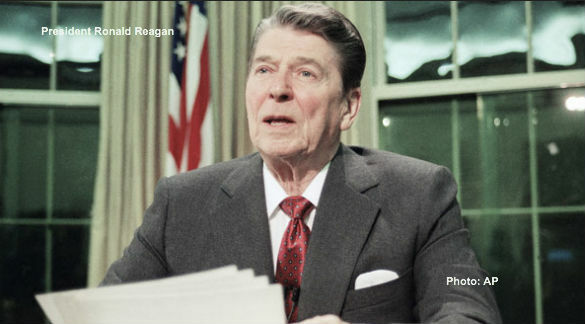 Dr. Aquilla was quick, and correct, to credit Ronald Reagan with sounding the death knell of the old ideas of nuclear preemption when he said "a nuclear war cannot be won and must never be fought." But by focusing on Reagan’s rebuilding of the conventional U.S. military Dr. Aquilla badly misinterprets Reagan and misses the lesson his long battle against communism has for our current conflict with al Qaeda and radical Islam. As President Reagan said in his second inaugural address, "America must remain freedom's staunchest friend, for freedom is our best ally and it is the world's only hope to conquer poverty and preserve peace. Every blow we inflict against poverty will be a blow against its dark allies of oppression and war. Every victory for human freedom will be a victory for world peace." Ronald Reagan understood that, as we do today, we faced enemies with whom there can be no compromise, only the victory or defeat of freedom. And most importantly, Reagan understood that to defeat the communist enemies of freedom we had to engage them on every battlefield of national power: cultural, economic and only if necessary, military. That is why he pumped up Radio Liberty and the Voice of America, supported the Solidarity labor movement by sending copiers and printing presses, not guns, to Poland, and made freedom for the captive people of the Soviet empire the foundation of his foreign policy. I suspect that Dr. Aquilla and I could agree that in radical Islam we have enemies who want to destroy our way of life because they truly believe that the misogynistic hell that was Afghanistan under the Taliban was the model for a pious society, and that with them there can be no compromise, only the victory or defeat of freedom. However, I believe we can’t shoot our way to victory over radical Islam – this is a cultural war – and preemptive strikes and the creation of the all-pervasive surveillance state necessary to make them a success defy the wisdom and the success of the one proven model we have for winning a cultural war; Reagan’s victory over communism. Unfortunately, the obsession of today’s policy makers with finding a military or “kinetic” solution to every national security problem has caused them to miss the most important part of Reagan’s strategy – to engage the enemy on every battlefield of national power: cultural, economic and only if necessary, military. The idea that “the beauty” of preemption “lies in the very low material costs of such a strategy” is dangerous and destructive. It requires the creation of an all-pervasive surveillance state to be successful, and it is discouraging America from making the fight against radical Islam the kind of cultural war that Reagan actually won by the longer and more expensive process of encouraging one person at a time to embrace the growth of freedom, democracy and free enterprise that was necessary then to defeat communism and is necessary now to defeat radical Islam. George Rasley, Editor of www.conservativehq.com, served as an advance representative for President Reagan. He served as special assistant for domestic policy to Vice President Dan Quayle, on the staff of former Senate Foreign Relations Committee Chairman Richard G. Lugar, as a consultant to the late Senate Foreign Relations Chairman Jesse Helms and as director of policy and communications for former Rep. Adam Putnam and as Director of Communications for Rep. Mac Thornberry, a member of the House Armed Services and Permanent Select Committee on Intelligence. Submitted by [email protected] on Fri, 08/16/2013 - 20:27. I disagree. There is no similarity between Communism and Islam except they both seek our destruction. A "Cultural War" against nomadic Arabs??!! Since the 7th Century, the only way Islam has been defeated or set back is militarily: 1)the three Crusades; 2)the defeat of the Moors invading France; 3)the defeat of the Islamic navy outside of Venice; 4)the destruction of the Ottoman Empire with WW I. It is time, again, for Islam to be crushed. Submitted by ronnine on Wed, 08/14/2013 - 20:41. I agree with the premise that Reagan, by choosing to "cut and run" from Beruit made the correct decision. His decision echoed that of president Eisenhower in 1953 and President Nixon's withdrawal from Vietnam. All three were decisions which the majority of Americans truly wanted. I also agree that president Reagan's policies, or more correctly, the ideas of George Kennan, when combined with a Soviet recession, led to the end of the cold war, but perhaps we should have been warned that the cost would be devastating to us, destroying our existing economic symbiosis and ultimately threatening our democratic experiment with oligopoly! Pre-emptive War Not the Solution? Submitted by tdupuy6 on Wed, 08/14/2013 - 18:15. I believe Mr Rasley misrepresents Ronald Reagan's defense policy. Rasley suggests that policy was more cultural perseverance than military might. I disagree. Ronald Reagan overwhelmed the USSR with his military build up and his clear willingness to use it if necessary. Cultural & ideological warfare were secondary to military deterrence. I submit that George Bush's pre-emptive strike into Afghanistan was an appropriate response to the 9-11 attacks by attacking the AQ safe havens there. Likewise, Operation Iraqi Freedom was an appropriate pre-emptive response to Saddam Hussein's continued support of terrorism, particularly knowing that he also tolerated a limited AQ presence in Iraq and had the capability produce and use chemical WMD. Unfortunately, Mr Bush allowed both military campaigns to escalate into nation building which was unnecessary. Then Obama exacerbated those situations by failing to secure a Status of Forces Agreement in Iraq and pursuing a half baked counter-insurgency "surge" in Afghanistan where a counter-terrorism strategy was more appropriate. I wonder what response Mr Rasley suggests would have been appropriate to the 9-11 attacks? Submitted by george.rasley on Thu, 08/15/2013 - 06:28. You can hardly call the post-9/11 war in Afghanistan "preemptive" since it was undertaken in response to an attack that killed some 3,000 Americans and was therefore "post" not "pre" an attack on the United States. Thus, according to the premise of the article it was an appropriate, if poorly executed, response. The writer seems to miss the most important point of the article -- that preemption is being sold as a cheap alternative and while one strike may appear to be cheap in material terms in the long run preemption has not proven to be inexpensive in treasure, blood or our own liberty. Most importantly, it hasn't proven to be successful in terms of defeating radical Islam.